When we were younger, we (especially Celine) loved Starbucks’ crumb cake. Who could blame us? It was a yellow cake topped with a thick layer of crumb topping and powdered sugar. 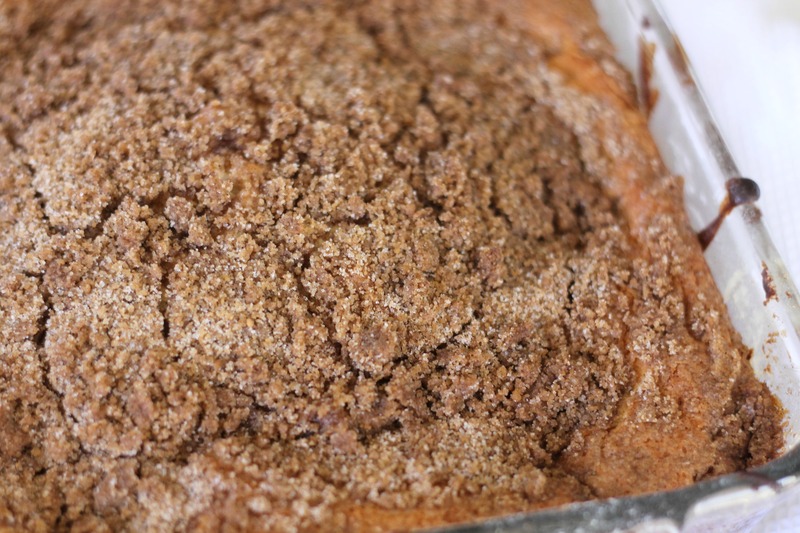 While we don’t really eat baked goods from Starbucks too frequently anymore, we did want to make some coffee cake. This recipe isn’t really similar to the kind from Starbucks, but that is okay because it is pretty delicious itself. 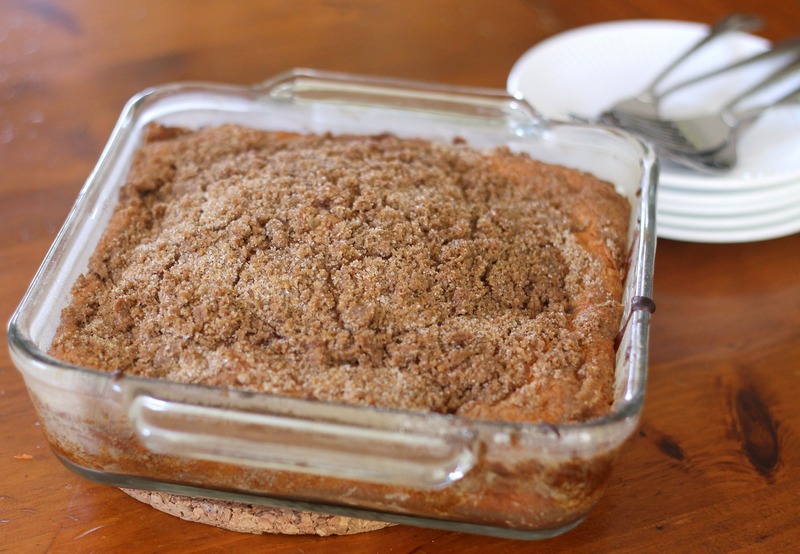 The cake part is pretty similar, but the crumb topping on this is a little crunchier and darker. 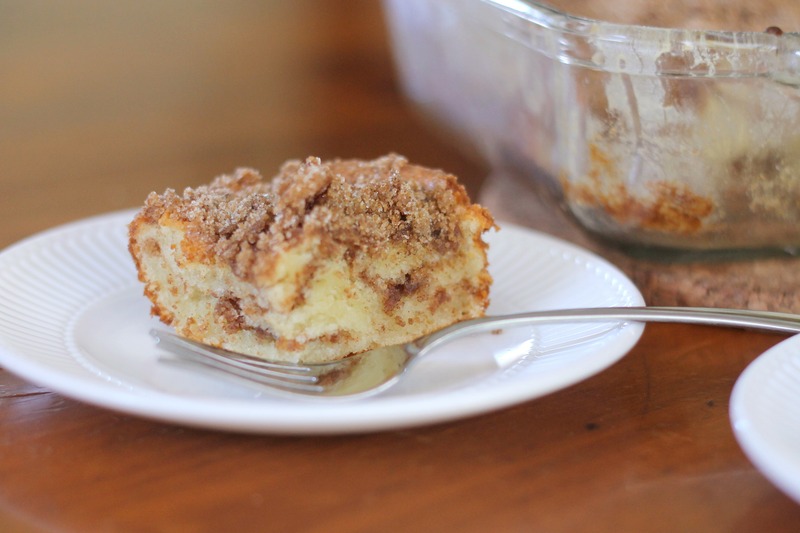 Someday we will probably try a New York-style coffee cake (sort of like the Starbucks kind), but for now, this recipe is pretty great. P.S. We halved the recipe and baked it in a 8-inch square pan instead of a tube pan. It fit perfectly and took about 40 minutes to cook. Place the flour, granulated sugar, 1/4 cup of the dark brown sugar, and the cinnamon in a food processor and process to combine. Transfer 1 1/4 cups of this mixture to a small bowl and stir in the remaining 1/4 cup brown sugar; set aside (this will be for inside the cake). Add the butter and pecans to the remaining dry ingredients in the food processor bowl. Process the ingredients until the nuts and butter have been broken down into small pieces (about 10 1-second pulses). Set aside (this will be for the top of the cake). Heat the oven to 350 degrees. Grease a 10-inch diameter, 10-cup capacity tube pan. Combine the eggs, 1 cup of the sour cream, and the vanilla in a medium bowl. In the bowl of a stand mixer, combine the flour, sugar, baking powder, baking soda, and salt at low speed, about 30 seconds. Add the butter and the remaining 1/2 cup sour cream and mix on low speed until the dry ingredients are moistened. Increase the mixer to medium speed and beat 30 seconds. Scrape down the sides of the bowl with a spatula. Decrease the mixer speed to medium-low and slowly incorporate the egg mixture in 3 additions, beating for 20 seconds after each addition and scraping the sides of the bowl as necessary. Increase the speed to medium-high and beat for 1 minutes (the batter should increase in volume and become light and pale in color). Add 2 cups of the batter to the prepared pan. With an offset metal spatula or rubber spatula, smooth the surface of the batter. Sprinkle with 3/4 cup of the streusel filling (without the butter or the nuts). Spread another two cups of batter over the streusel. Add the remaining streusel filling. Top with the remaining batter, and then the streusel topping with the butter and the nuts. Bake until the cake feels firm to the touch and a toothpick or thin skewer inserted into the center comes out clean, about 50 to 60 minutes. Cool the cake in the pan for 30 minutes. Invert the cake onto a rimmed baking sheet. Reinvert the cake onto a wire rack so that the streusel is facing up. Cool for two hours and serve. Enjoy!